The 2nd African Women in Film Forum (AWIFF), organized and sponsored by the African Women’s Development Fund (AWDF) and held from 23-25 September 2013 in Accra, Ghana gathered under the theme “Creating Compelling Social Justice Content for Film and Television.” Storytelling and the role of the storyteller was the leitmotif that traversed the panels, sessions and conversations throughout the three days. A highlight of the Forum was the presence of the renowned writer Ata Ama Aidoo. The objective of the Forum is “to utilise the power of film to accelerate efforts towards gender equity and social justice. We think filmmakers have a powerful role to play in shifting or reinforcing patriarchal attitudes, and we want to work with filmmakers to create a better world for women, and the community at large,” according to Nana Darkoa Sekyiamah. 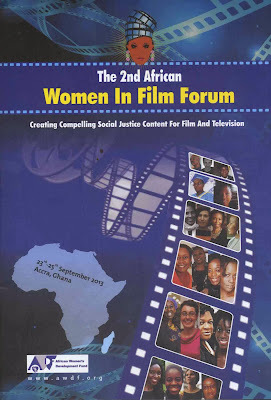 Women from the continent and the diaspora assembled to share, learn and strategize, continuing the conversation which began at the 1st African Women in Film Forum held in Lagos, Nigeria in 2010. In addition, the live Tweeter feed, which allowed people worldwide to follow the events in real time, is evidence of the role that AWDF wants to play as an important actor in the global dialogue in which African women will have a visible voice. For those who were not able to follow live, the very useful aspect of asynchronous communication allows one to join the conversation at anytime @ https://twitter.com/awdf01. Key women of the African Women’s Development Fund ensured a warm, convivial space in which to organize and network. Among these inspiring women were Nana Darkoa Sekyiamah, Communications Specialist of AWDF and the designated staff member leading on the organisation of the 2nd Forum, and Sarah Mukasa, AWDF Director of Programmes who opened the event with a welcome and update on the 1st AWIFF. Writer and documentary filmmaker Yaba Badoe followed with a short presentation on African women in film. Day One continued with parallel sessions lead by writer/playwright Sefi Atta with a focus on funding, and by playwright/scriptwriter Ade Solanke, who conducted a master class on scriptwriting. After the lunch break, Tsitsi Dangarembga, writer/filmmaker/founder of the International Images Film Festival for Women, facilitated a panel on funding for the film industry comprised of Korkor Amarteifio, Associate Director, Institute for Music and Development, Stéphanie Soleansky, Cultural Affairs Attaché, Institut Français du Ghana and Sarah Mukasa. The session that followed, conducted by François d'Artemare, Producer and founder of Les Films de l'Après- Midi, provided useful information for identifying producers, co-producers and film project development. The first day concluded with the evening screening of On the Border (a documentary which problematized the issue of landmines that remain after the liberation struggle) by Tsitsi Dangarembga and The Witches of Gambaga by Yaba Badoe. A lively Q&A followed. Day Two began with a conversation with Yaba Badoe, writer/director Sarah Bouyain, Lodi Matsetela, writer/producer/director and Beti Ellerson, Director of the Centre for the Study and Research of African Women in Cinema, who also facilitated the interchange. After a screening of a TV episode written and directed by Lodi and excerpts of Sarah’s work, the group explored myriad issues such as écritures of storytelling, positionality, identities and transnational dialogue. Settling back after the return from a lunch break during which conversations deepened and intensified, Vincentia Akwetia, Dean of Studies at NAFTI (National Film and Television Institute) facilitated the panel on the Ghanaian film and television under the theme “Challenges, opportunities and the way forward.” The panel included pioneer Kwaw Ansah, writer/director/producer, Anita Erskine, TV host/producer/ communications professional, and writer/film director Veronica Quashie. The second day wrapped up with an evening screening of Perished Diamonds by Anita Afonu, about the history of the Ghanaian cinema and Notre Etrangere |The Place in Between by Sarah Bouyain. An enthusiastic discussion followed. On Day Three, Sionne Neely lead the final panel entitled “The Way Forward: African Women in Film”, and composed of Tsitsi Dangaremgba, Ade Solanke, and director, Akosua Adoma Owusu, whose film Kwaku Ananse was screened prior to the discussion. Three action group breakout meetings were formed to explore issues to take forward or to be shared with others, and were facilitated by those who initiated them, continuing through lunch: Sarah Bouyain, a conversation and action set on what could be an African way of telling a story through scriptwriting and filming; Anita Afonu, how can we move forward in terms of how to archive Ghana’s film industry? and Tsitsi Dangarembga and Beti Ellerson, towards an African women and media manifesto, which during the action group was finalised as a declaration. The three day forum ended with the closing address by Yaba Blay, co-director and assistant teaching professor of Africana Studies at Drexel University (USA) and consulting producer for CNN Black in America 5 for the television documentary, “Who is Black in America?”.